Each year the RHS Chelsea Flower Show springs into life and treats us to an array of spectacular designs from The Silent Pool Gin Garden to The Wedgwood Garden. These displays never fail to inspire and encourage homeowners to venture into their own gardens and seek to become green-fingered enthusiasts. In celebration of this fantastic week, we have showcased some of the best properties with beautiful outdoor spaces currently available through our country branches. This enchanting and partly walled garden is sectioned into six areas, each benefiting from their own unique character and function. 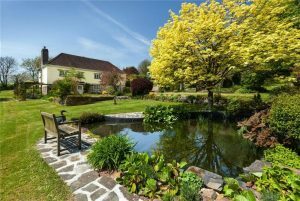 From the formal landscaped garden greeting visitors as they arrive and the inviting back lawn with a central ornamental pond to the white picket-fenced kitchen garden with raised vegetable beds, the garden can be enjoyed all year round. For those who love flowers, a spectacular multi-coloured rose tunnel is a standout feature, while wild flowers can be found at the southern end of the garden. 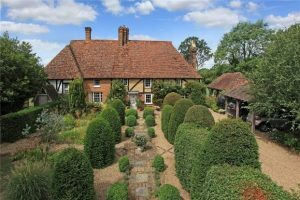 Shipbourne is a five bedroom cottage and is available for £1,175,000 through our Sevenoaks branch. For more information call the team on 01732 740600. 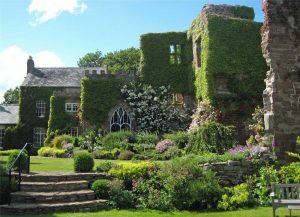 Those looking to escape to a magical setting need look no further than Wilton Castle. The lawned areas at Wilton Castle sit around the Manor House and boast beautiful borders featuring climbing roses and mature shrubs. Within the castle walls, the courtyard garden plays host to ornamental hedges and pathways, with apple, pear, apricot, plum and fig trees growing against the courtyard walls. The gardens are mainly set around the East and West sides of the Castle and run down to the River Wye. During spring time, snowdrops and daffodils cover the grassed banks of the moat, which is now no longer in use. The Grade I listed 12th century Norman castle provides a significant opportunity to own a home rich in history with grounds stretching down to the waterside. The five bedroomed house is available for £1,495,000 with our Cirencester branch. For more information call the team on 01285 653334. Cleave Farm’s four acres of grounds surround the property and make for the perfect spot for all the family to enjoy. The grounds include untouched woodland areas and a stream that play host to an abundance of wildlife, a sheltered split level terrace that is ideal for barbecues and al fresco dining, as well as an ornamental fish pond with a waterfall feature.The property is situated in a rural position, in the rolling North Devon countryside and benefits from access to an array of breath-taking walking, riding and cycling routes. Cleave Farm is a five bedroom home, available for £1,050,000 through our Barnstaple branch. To arrange a viewing, please call our team on 01271 325153.